The Amish Live Edge Tiger Maple Table showcases tiger stripe-like grain while using a modern color. The tiger maple has a unique, rather tiger stripe-like grain pattern. The table features a special modern grey color in addition to it’s unique properties. The Chairs feature Ebony stain to further enhance the tiger maple. The simulated live edge enhances the look while making a breathtaking dimension. The set has solid wood construction throughout, consequently made for lifetime use. 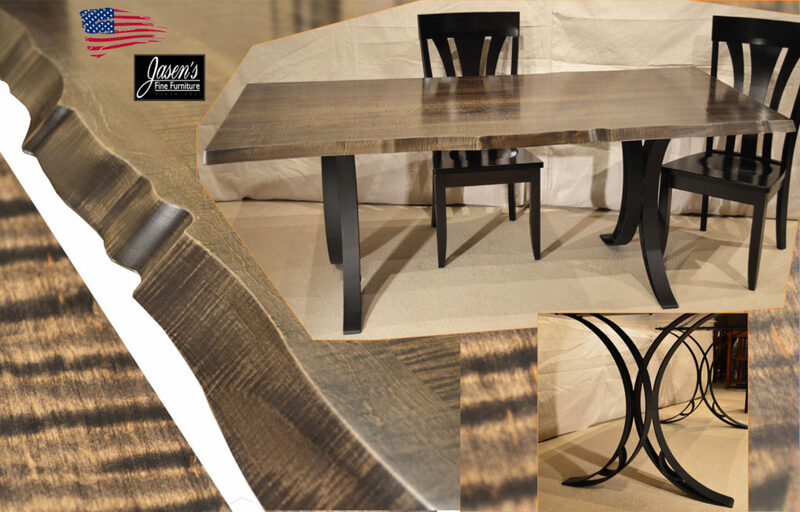 A black, curvy powder coated metal base further enhances the lines of the live edge. A customer can order this set in any size, wood, stain color, and fabrics! The Live Edge Tiger Maple set is made by the Amish, hence Made in the USA! Size shown: 40″ x 78″ Solid Top.